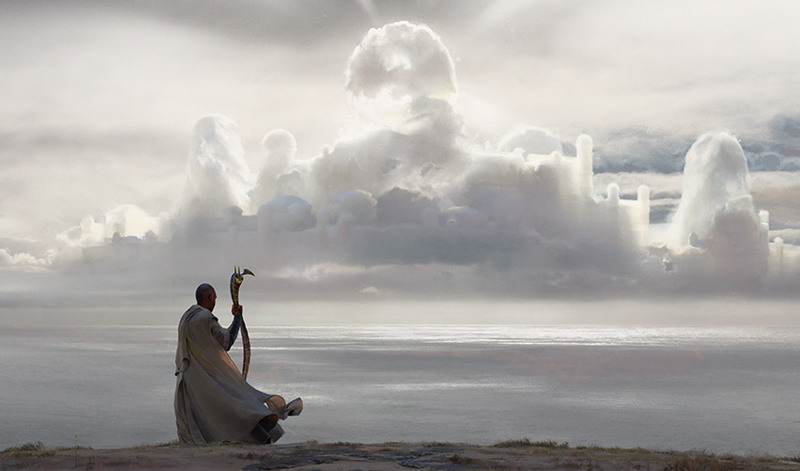 Teferi walked out to the beach before dawn, to where he could see Zhalfir reflected in the sunrise. He wasn't the only one. If you stood in the right place on the shoreline, if the weather was just the right balance between overcast and bright sunlight, the ghost of Zhalfir's coastline was visible. The translucent gleaming towers and domes floated as if on clouds above the sea. It was a pilgrimage still made here by many inhabitants of Femeref and other parts of Jamuraa. Some came to honor ancestors lost when the rift occurred, some came out of historical curiosity. This morning several groups stood on the beach, solemn and silent or talking animatedly as their children played in the surf. Others stood alone, like Teferi. He kept his distance, though the chances of him being recognized lessened with every century that passed. His own aging was now a slow process, but he had already long outlived his mortal enemies. The nearby town of Sewa had benefitted from selling supplies and lodging to the Zhalfir pilgrims and it bustled with activity all year, though Teferi only came in the cooler months. He had been wandering for the past several years, since the Mending, exploring Dominaria but never feeling the urge to settle down. When he had paid for his room in the hostel, the proprietor had said, "It must be a trial, to be named after the destroyer of Zhalfir." Destroyer of Zhalfir, that's a new one, Teferi thought with a sigh. His explanation was well-practiced. "It's an old family name, and no one wanted to offend my great-grandmother." The proprietor had nodded sympathetically, and that had been that. 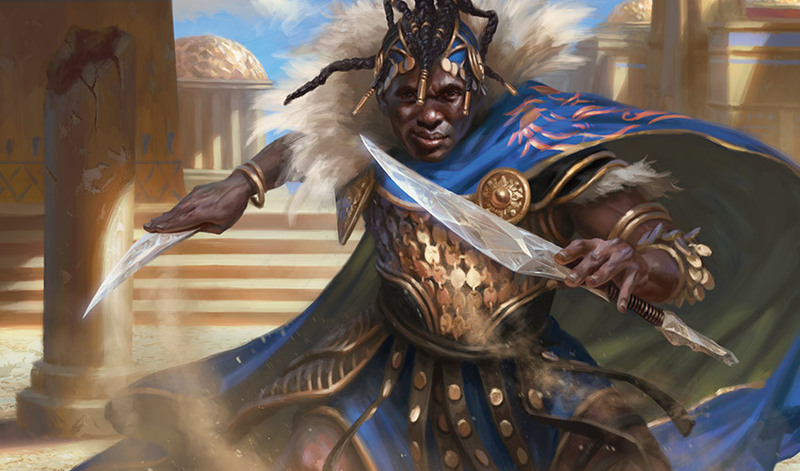 As the day's heat rose with the sun, Teferi walked back up through the dunes, the wind pulling at his blue robes. He took the path to the road and passed more pilgrims headed toward the beach—another group with children, two women, and a man walking alone—and nodded absently to them as he passed. The road ran along terraced fields and reservoirs, which gave way to garden plots and shade trees, then went through the open gates in the town's outer wall. The market plaza bustled with activity, with stalls under colorful awnings selling all sorts of food and drinks and trinkets to the pilgrims and locals milling around. Most of the crowd had the dark or brown skin of Femeref or northern Jamuraa, but there were a few travelers from other parts of Dominaria in the crowd. Sewa was a good town to visit, and the oldest quarter had mosaics in its plazas and columned houses that reminded Teferi of his old home in Zhalfir. Teferi wasn't sure why Zhalfir had been so much on his mind since he'd given up his spark. Guilt, surely, but he knew he had done the right thing. Zhalfir lived on, separate and protected from the forces that would have devastated it. Except lately that thought had begun to feel . . . self-serving at best. It had been the right decision at the time. Now he was no longer sure. It's not as if you can do anything about it, he told himself, weary with this internal argument. His Planeswalker spark had been needed to repair Shiv's time rift to prevent devastating destruction, and he had no power now to return Zhalfir. He found his way through the maze of streets, the high stone walls of houses to either side, passing the gates that led into their lush garden courts. As he entered the public fountain plaza, he saw two figures sitting on the low stone wall near the door of his hostel. 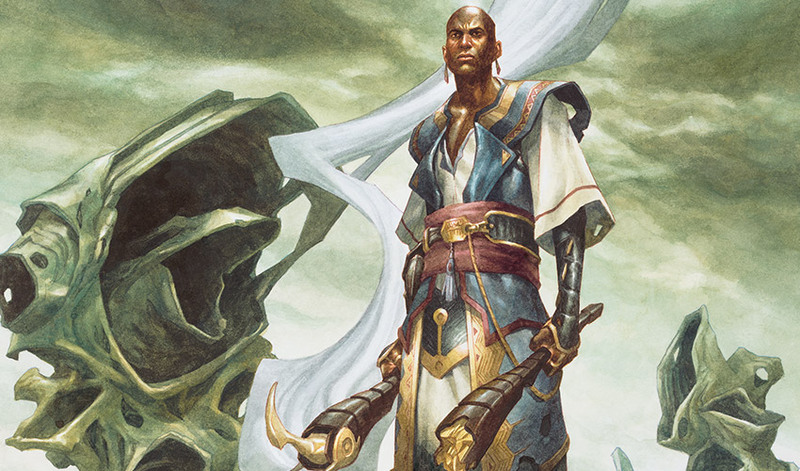 Teferi kept walking, kept his face and body language neutral. Not many people outside the new mage academy in Tolaria West knew who he was anymore. After Shiv, he had avoided using magic, had moved from town to town in Jamuraa until he had outrun his reputation. No one here should know he was that Teferi, the time mage who had stolen Zhalfir away, but he still had old enemies who wouldn't mind seeing him dead. And possibly new enemies. There were rumors of the Cabal gaining strength outside of Otaria, though no one was quite sure how, or what had spurred their resurgence. As Teferi reached the hostel's covered patio, the two people sitting near the door stood up to confront him. With no preamble, the woman said, "They say in the market that you're called Teferi." "They say a lot of things," Teferi countered. She was a very lovely woman, with strong features and a confident bearing. Her long braids had been tied back and piled atop her head and she wore the loose pants, shirt, and hooded robe of a caravan drover. A whip with a well-worn handle hung from her belt. The man was broad and muscular, wearing a sword and a warrior's leather and metal jerkin, his dreadlocks ornamented with copper rings. From the darkness of their skin, they might be the children of Zhalfirin families left behind when Teferi had created the time rift, but so were many inhabitants of Femeref. It didn't necessarily mean they had come here with an ancient family vendetta to kill him. The man smiled, and in a more amiable tone said, "This is Subira, and I'm Kwende." Without waiting for Teferi to acknowledge the introduction, Subira said, "You were expecting a visit from a man called Maket." Teferi kept his face polite, though he wasn't sure whether to be baffled or suspicious. "I'm sorry, you have the wrong Teferi. I wasn't expecting to see anyone named Maket today, or any other day." Subira lifted her brows, clearly skeptical. "You weren't." It wasn't a question, but Teferi answered it anyway. "No, I wasn't." He leaned on his staff, intrigued. If this was the prelude to an assassination attempt, it was at least unique. "What is this about?" Watching him thoughtfully, Kwende explained, "Maket said he was coming to see you, that that was the reason he was traveling here from Suq'Ata." "I can't help what Maket said." Teferi was beginning to think it wasn't an assassination attempt after all, but an ordinary case of confused travelers misunderstanding one another. "You'll have to look for him elsewhere." "We don't need to look for him elsewhere," Subira said, her expression skeptical and grim. "He's dead." Teferi stared at her. Now he was more intrigued, and much warier. "Would you tell me why you're here?" She exchanged an opaque glance with Kwende, then finally said, "I need to find out what happened at my caravan. Maket was killed in our camp, and he said he was coming here to see someone called Teferi." This was all very odd. Teferi said, "I swear to you that I didn't know this Maket." He knew he should walk away, maybe even pack his few belongings and leave Sewa entirely. But his curiosity was piqued, and he asked, "How was he killed?" Kwende's expression was grave. "By magic. Or at least that's what the caravan's physician believes." Huh, Teferi thought. "What sort of magic?" "We're not sure—none of us is a mage." Kwende lifted his brows inquiringly. "Are you?" Subira still watched him like a predator hoping for prey to break cover. Teferi decided not to answer that question. "It sounds like you need a magistrate." Subira held her suspicious stare for a moment more, then grimaced. "The magistrates in this town look on the caravan drovers as scapegoats for every crime that happens while we're here. I don't want my people harassed. I want to find out who did this and turn the culprit over to the town judiciary myself." Teferi could see her point. He said, "I'm sorry, I don't know anything about this man Maket." And if he was sensible, he would leave it at that. But he had never been sensible, especially where a mystery was concerned. And if this Maket had really been coming to see him, he should find out why. "Why did the physician think it was magic that killed him?" Kwende said, "Because it's been two days and his body is not showing any sign of rot." He held up a hand. "I know, the obvious solution is that he's still alive, but he's not breathing and he's as cold as a stone." This becomes more curious by the moment, Teferi thought. "Perhaps I could take a look," he said. Subira's brows lowered. Such an expression of deep suspicion tinged with irony shouldn't make her more beautiful, but somehow it did. "So you are a mage then?" she said. Kwende studied him intently. That still wasn't a question Teferi wanted to answer. "I'm a scholar, I know about many things. And you don't seem to have any other options, unless you want to ask the magistrates for help." Subira eyed him, but then said, "A good point. Well, come on, then." Teferi followed Subira and Kwende to the outskirts of the town, past the stables and cheaper hostels, then outside the wall to the rocky flats where the caravan's tents and wagons stood. Other travelers, mostly groups of pilgrims too poor to afford lodging in Sewa, had clustered close to the caravan camp for safety. The bluffs that sheltered the town from the worst of the desert winds gave some protection to the flats, but it was not a place where anyone would want to spend much time. As they walked, Teferi asked, "How well did you know Maket?" Subira said, "Not well. This was the first time he traveled on my caravan." She nodded to Kwende. "Kwende knew him better." Kwende shook his head a little. "We had traveled together for a time, before we joined up with the caravan to come here." Teferi had assumed Kwende and Subira owned the caravan together, and felt a jolt of relief that they were apparently recent acquaintances. Then he shook his head at himself.Idiot, he thought. He had no business thinking of potential romantic attachments, not now. And perhaps not for years yet, until people forgot he had ever existed. And that was a depressing thought, even for someone on his way to look at a dead man. He sighed deeply, and Subira threw him a quizzical look. She led the way through the camp to a tent that stood some distance away and was guarded by several caravan drovers. "We moved the body out here," she explained. Kwende added, "The other passengers insisted on it, afraid whatever he died of was catching." "It's a wise precaution," Teferi told them. "There are death spells intended to be spread to anyone who touches the victim." Startled, Subira paused, holding up the tent flap. "Really?" Kwende shrugged the concern aside. "The physician who examined him has come to no harm." "Well, not yet," Teferi said mildly, and ducked inside the tent. The dead man lay on a carpet, covered by a cloth, and Teferi pulled it aside. Teferi had wondered if the physician was wrong, if the man was actually alive and in the grip of some strange but natural paralysis. Maybe even some poison that could appear to lower the temperature of the body and disguise any sign of life. But as Teferi checked the man's eyes and pulse, he saw that wasn't the case. He saw something else, too. He said, "You and your physician were right, this isn't a natural death." Subira said, "So do you know him?" "No, I've never seen him before." Teferi sat back, watching her thoughtfully. "Someone has performed a spell or used a poison on your poor Maket to not only steal the life from his body, but to suspend and preserve it. It's done in such a way as to make it look like time magic." He pushed to his feet. Subira's eyes narrowed, and Kwende's expression held a certain wary tension. He said, "Was it?" "If this was time magic, he would be suspended and seem not to move or breathe, but he would be alive, his body would still be warm, and when released he would go on his way as if it never happened. Time magic also takes effort to maintain, and can't be held indefinitely." Teferi shrugged. "So if I was going to kill a man, I certainly wouldn't use time magic, at least not in that way." He smiled. "I know you think I did this. That's why you came looking for me." Subira glanced at Kwende, who was still watching Teferi like a man prepared to defend himself at any moment. She said, "Did you kill him?" Teferi told her, "Luckily for our burgeoning friendship, I did not." Kwende relaxed a little, no longer expecting an attack. Subira's gaze was thoughtful, and it was hard to tell if she believed Teferi's denial or not. "Maket told Kwende you were a time mage. I wasn't sure I believed him." "Neither was I," Kwende said. "But it seemed to explain . . ." He gestured to the body. ". . . this." Teferi looked down at Maket again, frowning. Someone who knew who Teferi was had obviously sent Maket on this journey, but then what was the point of killing him before he completed it? Was Maket collateral damage, or was the plot aimed at both of us? Teferi wondered. "Hmm." Subira lifted her brows. "Is that all you've got to say?" "I always have plenty to say; it's one of my faults." Teferi grinned at her. "Did he tell you why he wanted to see me?" "No, and I didn't ask," Kwende said. He was still skeptical, though something in his bearing made Teferi think that while he certainly believed that Teferi was a powerful time mage, he didn't believe Teferi had killed Maket. "It was none of my business, and I had no idea it would become important later." Teferi nodded understanding. "Did you search his belongings?" "Not yet." Subira turned to lift the tent flap and gestured to one of the drovers. "Akime, go and bring Maket's baggage, please." "I'll get it," Kwende said as he ducked out. "It's in my tent." "Thank you," Subira called after him. She turned back to Teferi and they contemplated each other in silence. She finally said, "I was certain you were the culprit, so there was no need to look for clues, like a character in a story." Teferi had to tease her. "And now you know I'm not the culprit?" Subira's expression was ironic. "Let's say I'm open to other theories." "What other theories would those be?" Teferi was honestly curious. At the hostel, Subira had seemed more aggressively suspicious than Kwende, but she clearly had an open mind. Maybe Kwende had been just as suspicious, but better at hiding his real feelings. Subira folded her arms, studying him. "That Maket was sent here to kill you." That was far too close to the theory that Teferi was inclined toward. He hesitated, not sure what to say. There wasn't much reason for anyone to kill the pilgrim scholar of Zhalfir that Teferi had been pretending to be for the past several years, even if he was a time mage. Then Subira added, "I think you're not just a Teferi, but the Teferi." They eyed each other for a long moment. Subira didn't seem appalled by the idea that she was facing the Destroyer of Zhalfir, but it was hard to tell. Teferi let his breath out and admitted, "If I am that Teferi . . . Let's say that someone being sent to kill me is not an unusual occurrence." Subira's brow furrowed. "But would they send only one assassin? I think you're far more dangerous than that." Teferi kept his smile light. As much as he wanted to see it as flirting, he knew she was too straightforward for that and was simply speaking her mind. "Your confidence in me is gratifying." Subira's expression was serious. "I know a dangerous man when I see one." She knew he was dangerous, but she hadn't expressed any contempt or dismay. Teferi had to ask, "It doesn't bother you, knowing who I am?" Subira shrugged. "My family were always travelers. None were in Zhalfir when it . . . left." She added, "I was never raised to think of Zhalfir as a birthright that was stolen from me. I've also read about what the Phyrexian invasion was like, and seen the remnants. I can understand why you did it." She hesitated, then her mouth twisted a little in sympathy. "They say you don't have the power to bring it back. That must be . . . hard." Her simple acceptance of those facts made the knot of guilt in his heart loosen. "When I created the Zhalfir rift, I was so certain I was right, that I was saving my home from a horror that would utterly destroy it. Now I question my decision every day, but I have no power to change what I did." It was surprisingly easy to make the painful admission. He met her calm gaze and felt no urge to look away. This was the first time he had had an honest conversation with anyone in years, and it was almost making him dizzy. Subira nodded, accepting his confidence without comment. "So we know you have enemies. But if Maket was coming here to kill you, then who killed him?" "A good question." Teferi paced the tent, trying to concentrate on the problem at hand. "Perhaps Maket discovers a plan to kill me. He travels here to warn me, but the mage behind the plan kills him, and makes it appear that I did it." He glanced at Subira. "Then you go to the magistrate, I'm accused of the crime . . ."
Subira tone was ironic. "And you meekly go into custody until you can prove your innocence." "No. I wouldn't let them arrest me. Being confined in a cell is not something . . ." Teferi decided not to finish that thought. It wasn't the same as being trapped in a time bubble, but it wasn't something he wanted to experience again. He would never let himself be imprisoned, and anyone who tried it would find out just how dangerous he was. "But the plan didn't work," Subira said, and made an impatient gesture. "It makes me wonder what whoever did this is thinking now. Or doing now." "Subira!" someone shouted from outside, his voice rough with alarm. Subira shoved the canvas aside and ran. Teferi ducked out after her and stopped in his tracks. "Uh-oh," he muttered. Rolling toward them out of the desert flats was a sandstorm. The wall of sand and dust loomed so large it was like a giant ocean wave, or an avalanche of rock tumbling off a mountain. It would hit the caravan with the same impact. Sewa, partially protected by the bluffs and its stone walls, would probably survive. What the storm would do to anyone caught outside, and the livestock and gardens and fields and everything needed to survive the next season, was a nightmare. Teferi strode toward where Subira and the drovers stood frozen in horror. It was too late to run, though from the shouts and screams from the tents and wagons, some were attempting it. "What is that?" Subira demanded. "An illusion?" "No, it's real." Teferi could feel it in the air, with a weight and electricity an illusion could never duplicate. "But not a coincidence," Subira said grimly. 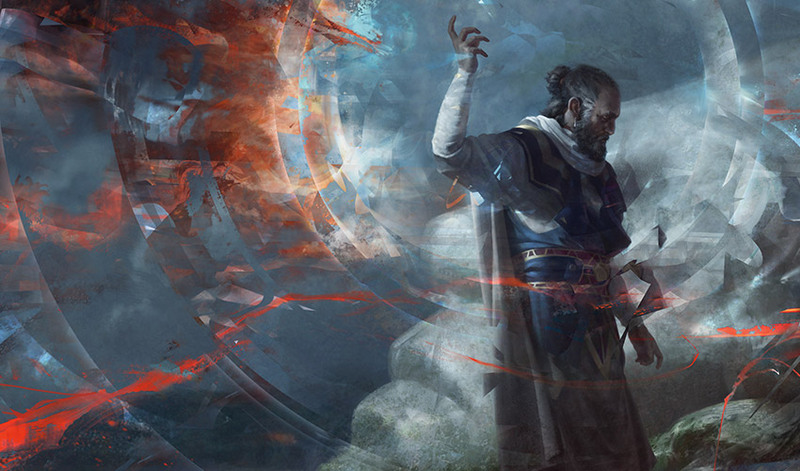 "A powerful mage could raise this out of nothing," Teferi said. "A not so powerful but knowledgeable mage could raise it with several different spells over a period of days, nudging various winds and air pressure systems. It's a complicated process—"
"Which you can explain later if we survive." Subira made a helpless gesture. "Can you stop its time? Make it freeze?" It was too large, too diffuse. "No, I'm going to have to think of something else," Teferi said. He had already thought of something else, he just didn't know if he could make it work. He strode forward away from the others, to the edge of the shelf of rock. He lifted his staff to give himself an anchor and hoped he had estimated the distance correctly. He cast the spell to stop time for a bubble of air ten feet in front of him. Inside the bubble, drifting dust motes froze in place. 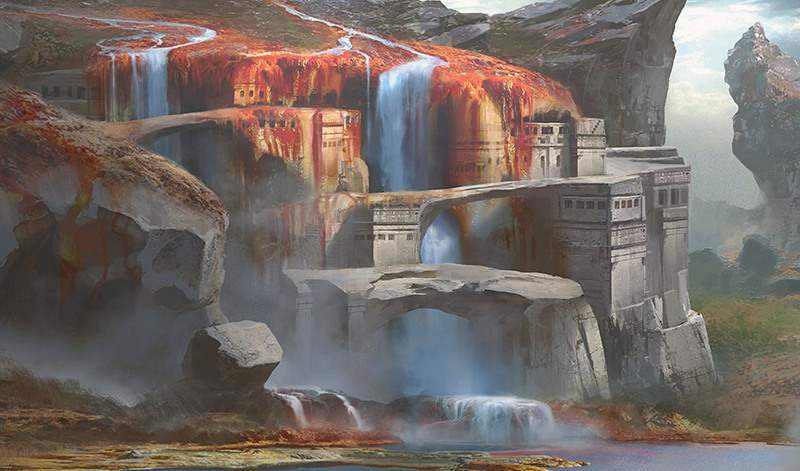 Gathering every scrap of power he still had, Teferi stretched the bubble and made it longer, wider, higher, extending it seaward toward the bluffs that formed a natural windbreak for the town and outward to shield the caravan grounds, then up as high as he could stretch it. He made sure to keep it at an angle, using the sharp edges of the rock shelves as a guide. Logic said this should work; Teferi just hoped logic was right. An instant later the leading edge of the storm struck the time bubble and slid sideways along it, out toward the open desert. The wind howled in confusion and sand blasted against the bubble. Teferi held it as long as he could and then longer, darkness creeping in on the edges of his vision. The sheer effort made his body feel as light as gossamer, as if his feet floated above the ground. He wasn't sure if that was really happening or if it was what fainting felt like. He thought it might actually be a faint. Then he hit the ground and the bubble collapsed. Teferi braced himself for an unpleasant death. Being skinned and scraped raw by sand was not a good end to his life as an aging former planeswalking immortal. But the wind that flowed over him was no stronger than a normal harsh desert wind and the sand it carried was abrasive but not fatally so. It died away to fitful dust-filled gusts. Subira leaned over him and shook his shoulder. "Are you all right?" Teferi took a breath to answer and choked on sand. Subira hauled him into a sitting position and pounded him on the back until he could breathe. He wiped watering eyes and lifted his head to see the caravan grounds still intact, though tents, wagons, and agitated animals were covered with a layer of dust. People staggered around coughing and flailing, and those who had fled slowly returned, clearly amazed at their survival. The town looked in better shape, where confused inhabitants gathered on the rooftops and in the windows and doorways of the houses built back against the cliffs. As Subira helped Teferi to his feet, her drover Akime ran to help. As they reached the tent, another drover ran up and said, "They're coming from the town, a crowd of magistrates. They say someone here brought the storm." "Who brought the storm?" Subira asked. As the man hesitated, she said, "Just tell me!" "Him, Teferi," the drover said. "That's a lie," Akime protested. "It was Teferi who saved us. We saw him with our own eyes. Why call a storm only to half kill himself stopping it?" Subira looked toward the town gate, where the approaching crowd was just visible. She said to Teferi, "This is the work of whoever is trying to kill you." She turned toward the drovers. "Who went to town? Who brought these people?" Akime gestured in confusion. "No one! We've all been here. Only Kwende—he went to arrange for Maket's body to be taken away." "Kwende?" Subira repeated. Her eyes widened. "Oh, for the love of—"
"Kwende who told you Maket came here to look for me, who said Maket told him I was a time mage?" Teferi asked grimly. It was clear as glass now. Maket had probably been an innocent victim, a pilgrim traveling here who Kwende had befriended as part of his plot. Once Teferi had been taken by the magistrates and their mages, the sandstorm would have already destroyed the evidence in the caravan camp and the witnesses who might have contradicted whatever story Kwende meant to tell. Subira swore in angry realization. "I've been a fool! He's lied to me all along." She turned to Teferi. "Freeze time and run." "I can't, not now." Teferi was too exhausted to freeze more than a cloud of angry gnats. He had to recover before he could use his power again. Teferi hesitated. Running away felt like . . . well, like running away. "But—"
Subira hissed, "Hurry, you idiot!" So Teferi ran. He dodged through the tents, keeping the bulk of the wagons and the camel pens between himself and the group of magistrates. He headed toward the rocky hills at the far end of Sewa's wall. He would have to hide until nightfall, then find some way to get provisions before he left. The sword swing came out of nowhere and Teferi flung himself sideways. He hit the ground and rolled. Kwende leapt out from between the tents. He moved so fast he was like a blur. Teferi flung up a hand and accelerated time around the sword blade that drove down toward his chest. As it struck him it shattered into pieces, the steel rusted through. Kwende staggered, overbalanced, and Teferi scrambled away. He grabbed his fallen staff and managed to shove himself upright. Kwende recovered and drew two long knives, their blades gleaming with crystal. 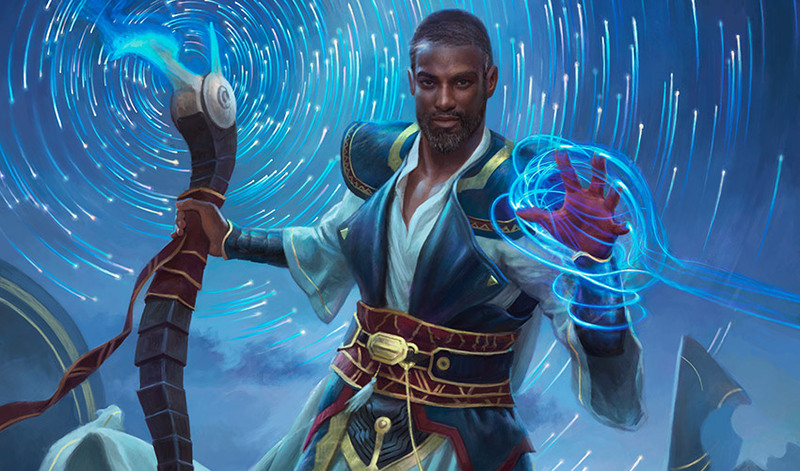 Teferi held his staff out like a man about to cast a devastating time spell, but he knew he had maybe one or two minor efforts left in him before he collapsed entirely. "Why are you doing this?" he demanded. "It was the only way to get to you," Kwende said, his face hard with fury. "Traitor, destroyer!" He surged forward. Teferi managed to slow time a little, so Kwende's blindingly fast assault turned into a slow menacing pace. Teferi backed away. "You brought the storm." Kwende's grin was more like a grimace as he fought Teferi's waning power. "I hired a mage to make the spells that stirred the winds, and to make the death magic poison, so Maket would look as if he had been killed by a time mage." "Who are you?" Teferi demanded. If he was going to die, he wanted to know why. "My ancestor was Mageta the Lion." Kwende's gaze was as hard as iron. "He was in Ki'pamu when you destroyed it." "The general." Teferi's heart sank. He shook his head. "It wasn't destroyed—"
"Liar!" Kwende's muscles bulged as he fought the time spell, and Teferi knew he couldn't hold on much longer. Then a whip cracked, wrapped around Kwende's arm, and jerked him aside. Subira stood with Akime and her other drovers behind her, all armed. She shouted, "Leave him alone, Kwende! He didn't kill Maket, and he didn't raise the storm. You did that. You are the murderer!" Kwende's face showed only determination. "Because he was too powerful to kill, I had to weaken him first. You don't understand—"
Subira waved a hand, her face incredulous. "Weaken him? And kill half the town and everyone in my caravan camp to do it? And what about Maket? Your precious Mageta would be proud of that, would he?" She grimaced in disgust. "We've traveled together, Kwende, and I know this isn't worthy of you." Kwende glared at her. "Maket was a thief and a murderer. I would never kill an innocent." Subira was unimpressed. "But you were willing to sacrifice everyone in the caravan camp to trap Teferi." Kwende shook his head, confusion overtaking his anger. "I knew he would turn the storm and save them." Subira was baffled. "You knew he would save them? But you still want to kill him." "He is the destroyer of Zhalfir!" Kwende shouted. "I have been told my whole life that my blood must have vengeance on his!" Teferi grimaced. Kwende had been raised on retribution and blood feud for Zhalfir, for the loss of people he had never known, a place he had never seen. He thought killing Teferi was his only way to freedom from that suffocating legacy. Teferi said, "Zhalfir is not destroyed! Go to the beach with the other pilgrims and look at it! It's still there, and if I could return it, I'd give my life to do it right this instant." Teferi controlled his voice with effort. "But my life isn't enough. I don't have the power anymore. It's impossible." Akime said urgently, "Subira, the magistrates are coming. We need to go." "Get my wagon. I'll go ahead with Teferi and meet you at our next stop," Subira told him. Kwende said raggedly, "No, I won't let you take him away. I've waited too long—"
Subira dropped her whip and strode forward until she stood almost chest to chest with Kwende. She said, flatly, "Then kill me. That's the only way you'll stop me. You're either a murderer or you're not, Kwende. Choose." "Subira," Teferi said, his voice a dry rasp. He was terrified Kwende would drive his knife into her heart, and Teferi hadn't the power to stop him. "Don't. Don't risk yourself . . . Kwende, please don't kill her." She ignored him. Kwende stared at her as the moment stretched, then he slowly stepped back. He backed away and the drovers moved to get between him and Subira. Then Akime drove up with Subira's wagon. Kwende stood there as Subira shoved Teferi up onto the driver's box. As she climbed up to take the reins from Akime, Kwende said, "Why are you doing this for him?" "I'm doing it for both of you, you idiot," she said. "Now go away and do something worthwhile." Akime jumped down. As the wagon rolled away, Teferi said, "You could have been killed." He trembled with exhaustion, his powers depleted. "You're welcome," Subira said pointedly. "The least you can do is come with my caravan and keep the thieves and raiders and other threats off us. A time mage should be good at that." Teferi slumped back against the seat, giving the thought serious consideration. It was tempting. If he had to keep wandering, it would be good to do it with company. Company who he wouldn't have to lie to about who he really was. "For a while," he promised finally, as the wagon rolled over the bumpy road. "I'm not one to settle down." "Niambi, be careful!" Teferi called to his daughter. She was running in the court again, chasing the dragonflies that clustered around the lilies in the fountain pond. The big house under the acacia trees was spacious and comfortable but old, and the flagstones paving the court were uneven. The cracks were just the right shape to catch unwary little feet. 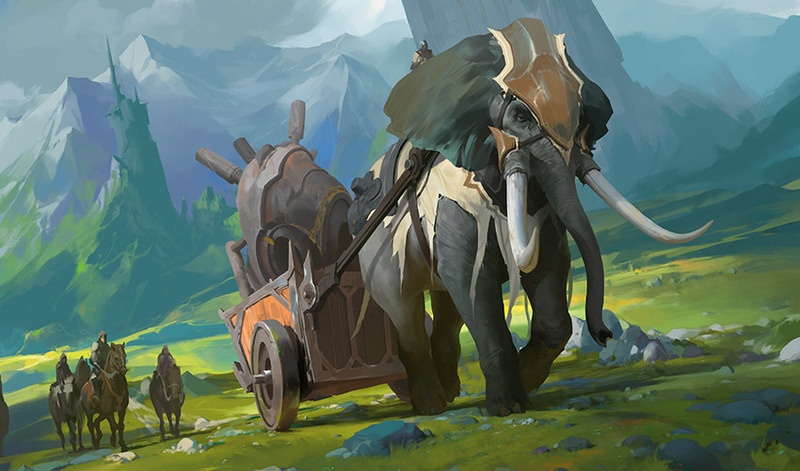 A few years ago, Subira had found someone else to run her caravan, and she had settled down with Teferi in this town near one of their old routes, long enough to have Niambi. She had gone back to her caravan now, visiting regularly as Teferi raised their daughter. Teferi froze for an instant, too, startled at himself. He obviously hadn't lost any of his fighting reflexes, even after so long without using his magic. He stepped forward and circled Niambi, carefully examining her angle and trajectory, making sure there wasn't anything sharp or hard in her path. When he let her fall, she would land on the grass, possibly get a bruise or two, and hopefully learn a lesson about running in her sandals on the court's uneven flagstones. There was no other choice, really. But he thought how once there had been a choice, between Zhalfir's devastation and removing it from the world, preserving and trapping it. Thinking of Niambi preserved and trapped like a bone in amber turned his stomach. He couldn't keep her safe at the cost of her freedom and growth. It seemed obvious. It hadn't been obvious with Zhalfir, when there was no guarantee that anything of Zhalfir would have survived the Phyrexians. 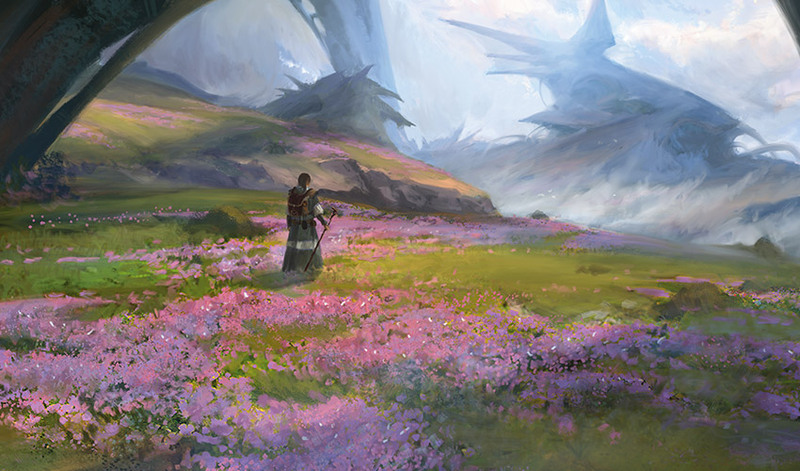 But so much of Dominaria had survived, if not intact, then with enough of itself left to grow anew and evolve. Teferi let his breath out. He had known for a long time that if he could return Zhalfir, he would do it. But no amount of soul-searching would give him the power. But some other sort of searching might, Teferi thought. Urza had certainly created powerful artifacts that might help. It was worth looking into. But for now, he decided a compromise was best. He stepped around in front of Niambi and released his spell. As time moved around her again, she landed in her father's arms and laughed with delight.